Will Washing Your Walls Ruin Your Interior Painting? When it comes to your home’s interior, life happens. Your wooden floor gets scratched, a crown molding gets chipped or the walls get drawn on with crayons (assuming you have younger family members inhabiting your home.) In the case of your walls getting stained or damaged in some way, you may be wondering how you’re going to clean them without damaging the paint job in the process. If you’re unsure how you’re supposed to clean a wall without watering down the paint, keep reading! When determining how your wall’s paint job will respond to cleaning solution, you’re going to want to consider the glossiness of the paint. Glossy paints create a harder surface, which in turn makes it more difficult for stains to seep inside. It also means you’re less likely to damage the paint when you do eventually begin scrubbing. If the paint is flatter, it’s far more likely to get damaged while scrubbing, so keep this in mind. A great way to test how durable your walls are is to scrub a smaller and less noticeable area first. That way in the event that your wall does become permanently damaged, it’s much easier to fix. If your walls are painted with a simple white paint, such as eggshell or satin, it should have an average level of glossiness to them. If you intend on cleaning doors, window frames, baseboards or trims, it’s more then likely using a semi-gloss paint. That means you can wash it without any concern of bleeding or damage occurring to its surface. To start, locate a basic soft sponge and not any other products like “magic erasers.” These usually contain other chemicals and unless you’ve used them before, you have no idea how your painted wall is going to react after scrubbing. You’ll also need a small bucket of water. The water doesn’t need to be particularly hot; room temperature is sufficient enough for cleaning walls. Scrub the wall gently, making sure not to rub too hard. If water isn’t enough to remove the stain, you can introduce dish soap or vinegar, both of which add a bit more punch to your cleaning. If you’re dealing with a wall that is covered in crayon, it may actually be more productive to repaint the wall rather than attempt to wash it. Crayons are considered grease stains, which means you’ll need to use stain-blocking primer before you begin painting. Failing to do this will result in the stain bleeding through the paint, and you don’t want your guests to notice it! Of course, you can always hire a professional painting company if these stains are proving to be difficult to remove on your own. By calling one today, you can get the best advice on how to approach cleaning walls with imperfections! The team at Platinum Painting is a recognized leader when it comes to interior design. 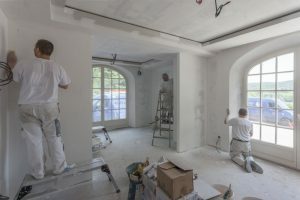 They only focus on residential homes, which means they are the most knowledgeable when it comes to repainting dated or imperfect walls for homeowners. If your wall is stained and you need a professional’s touch, don’t hesitate to contact the Idea Guys through their website. Comments Off on Will Washing Your Walls Ruin Your Interior Painting?